So here I am, back in the Lake District for the second weekend running - how lucky am I?! It was just a seed of an idea that led to Marcus and I driving up yesterday (Friday 19th August 2011) to Wasdale Head and setting up camp in the National Trust campsite. We left sunny Chandlers Ford about 9am and arrived in Wasdale at exactly 3pm - not a bad drive and the traffic (for once) was kind to us. The site was good and although there are no marked pitches we managed to bag a spot next to a large oak tree overlooking the gently babbling waters of Lingmell Beck - ideal! 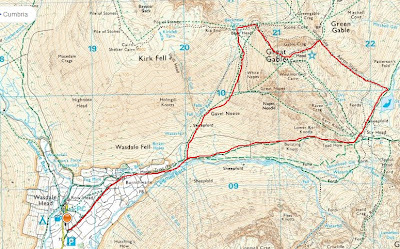 The plan was to arrive, pitch up, walk Great Gable and then head back to the Wasdale Inn for some dinner and then to walk up Scafell Pike in a circular route today (Saturday). However, on arrive 2 things struck us; 1 the weather was pretty poor and getting worse and 2 time was not on our side and the 4hr walk that is Great Gable would not really allow us any time for error if we wanted to have something to eat at the pub! So, we decided to pitch the tent and go for a "wander" along Mosedale Beck before a decent pint and a meal at the Wasdale Head Inn. The weather, at points along the Beck, was pretty dire and we both stopped numerous times to watch the clouds scudding along the side of Kirk Fell and Red Pike. However it was at the same time that we both started to look longingly up to the cloudy summit of Great Gable, wondering if that would be a better walk for the Saturday than the route up Scafell that we had planned. It was one for consideration so we headed off to the pub for a decent meal and some further discussion! Pie and chips were eaten, beer drank, maps and Wainright books consulted and finally we decided on a circular route up Great Gable instead of the Scafell walk (much to my joy having walked Scafell Pike twice and Scafell only the weekend before!). 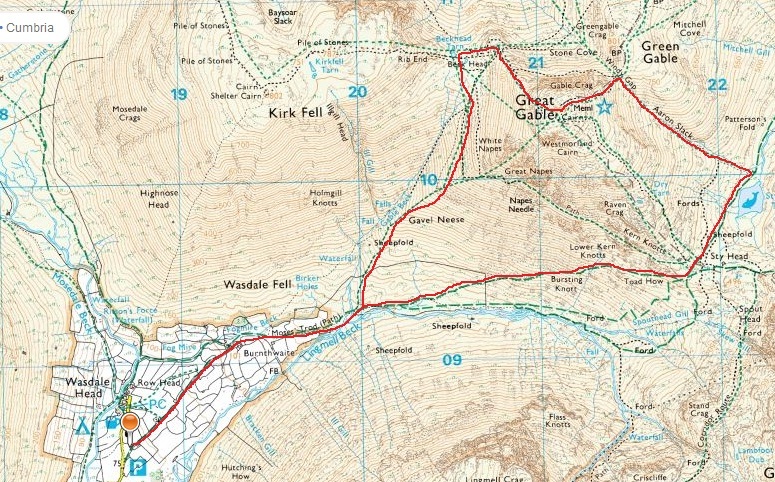 The route we settled on was from the parking area at Wasdale Head, along Moses' Trod Path, the left along Gable Beck to Beck Head, up to the summit of Great Gable, then down to Windy Gap and along Aaron Gap to Styhead Tarn and then Sty Head. From there we'd follow Lingmell Beck and Moses' trod path back to the car. That night we poured over maps and read sections of the fantastic Wainright books to glean more information on the route we'd be taking the next day - then turned in for an early night about 9pm! The rain that night got progressively heavier until at one point I was sure that the river would burst it's banks and we'd float off - your mind does funny things to you at 3am in the morning after a few beers! But morning came and we were still safe on the bank and the river was flowing nicely contained within its banks - but more importantly the rain had stopped! So we cooked a quick breakfast of bacon and eggs, filled up water bottles then packed up camp and then headed off to the car park area at Wasdale Head for the start of our walk with fingers crossed that the weather would hold out for us. We locked the car and headed off up Moses' Trod path which tracks along the rushing Lingmell Beck towards Great Gable which today had its head firmly embedded in the clouds that we hanging around from about 700m upwards. The right hand turn onto the path that leads alongside Gable Beck and up the side of Great Gable heralded the real start of our walk and from here we started to gain vertical height almost as quickly as we were covering distance - 1:3/4 according to AW himself! Just below the amazing White Napes you head off to the right (due North) and along a scree slope that tracks along the side of the mountain towards Beck Head and Beckhead Tarn and from here you turn almost back on yourself, heading SE, and climb steeply towards the summit of Great Gable. When we arrived at the summit (899m) it was still grey and cloudy so we only paused long enough to read the summit memorial, put on our shell layers and consume a few snacks and the obligatory scotch egg! Then it was back off on the path down towards Windy Gap. Now it's worth pointing out that there are two main paths off Great Gable, the most direct path back being the main one and most easily visible from the summit but the path to Windy Gap is on a heading of 60 degrees from the summit and can be picked up after about 50-60m of walking on rocks and scree until a clear path develops. Upon reaching Windy Gap (which today was ironically still and sheltered) we headed down Aaron Slack towards Styhead Tarn. When you reach the tarn it is natural to think that you're much lower than you actually are as you've covered a fair bit of descent - but in reality you're still at 450m so there's a fair way to go! From here the walk passes Toad How and Bursting Knot before tracking along Lingmell Beck (Moses' Trod Path) back to the car park area. All in all the walk took us just over 4 hours as while we made good progress up and down Great Gable we did indulge in a number of photo and "scenic appreciation" stops! 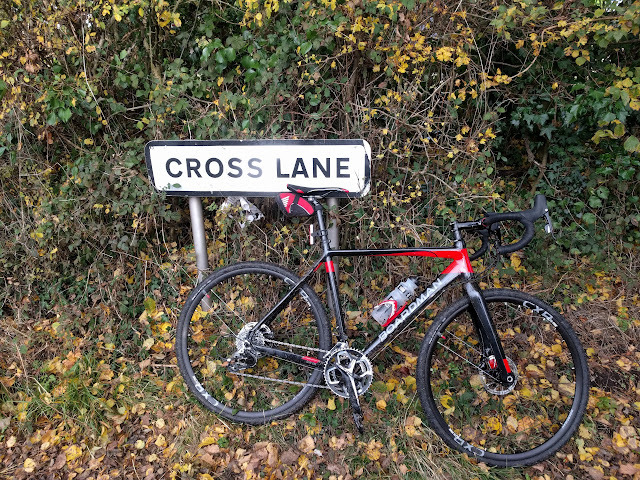 (Route details from Garmin Edge 605 (via Garmin Connect) - click here). The walk was tough in places but was, honestly, one of the best walks that I have had in the UK. It was quiet and rugged, the scenery was amazing and the weather was nearly great! It was the Lake District at its best and I would recommend it to anyone who visits Wasdale Head and wants to experience something a bit different from Scafell Pike and wants to get away from the crowds. Once back at the car we had time to boil up a quick brew before heading off for the 330 miles back to the south and home - our trip to the Lakes had ended all too soon but we spent the next 6 hours discussing the next trip up and the walk that we wanted to attempt from Wasdale to Glaramara and then across to Ill Crag, Scafell Pike and then Scafell!! I think that's the best thing about hiking and mountaineering anywhere in the UK - no matter how good a day you've had, you always feel inspired to plan the next one, knowing that the lure of the mountains will keep you ticking over until you finally get the chance to come back again!